Model T Ford Forum: Speedster finally finished! Model T Ford Forum: Forum 2018: Speedster finally finished! 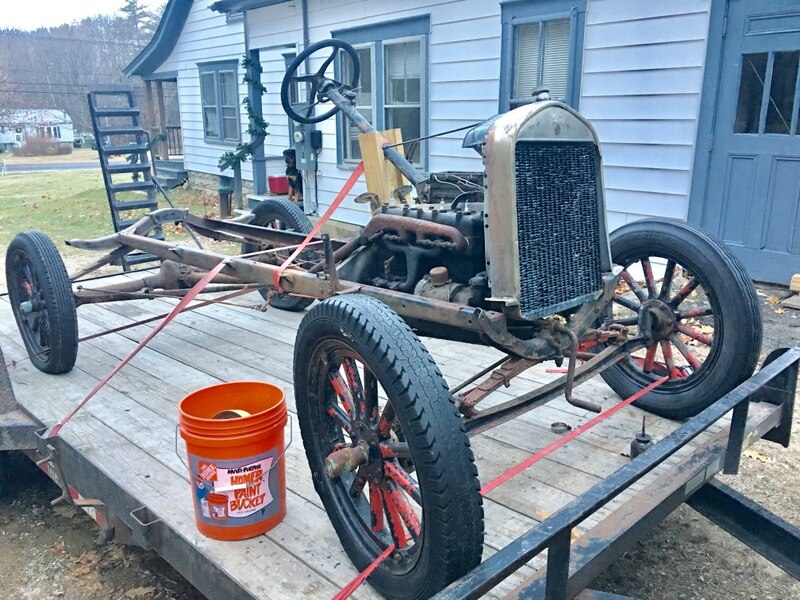 Bought a supposed running chassis (1927) in November last year. Worked on it a little now and then, and got it running early this year. Had to put it away until the spring to start working on it. Thank you everyone on this forum for the great deal of help and support that has beb provided to me. Out of all the little hobby groups I have been part of, you are the nicest bunch by far. 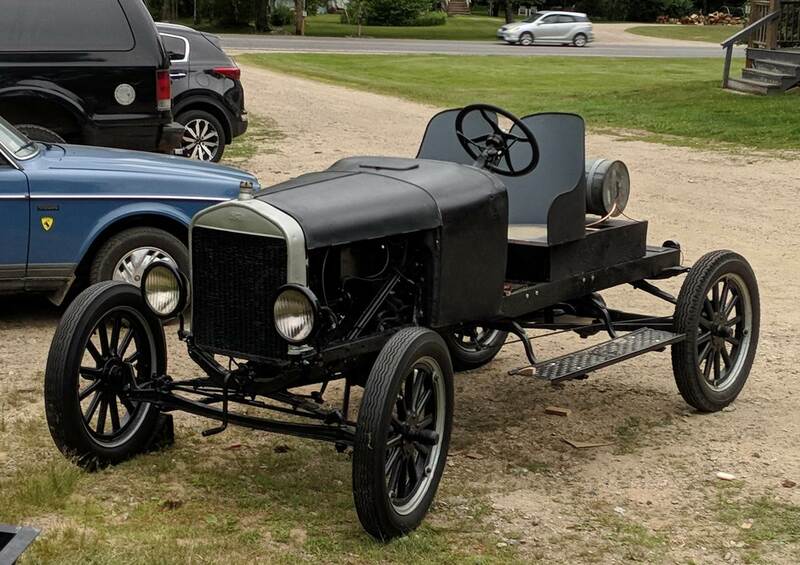 At just 16 years old, I have my very own 1927 T that I built by myself. The other day I went for my first real road ride with my father. It was getting dark and I had just gotten out of work. Turned on the headlights and got the the end of the driveway, turn right and went about 50 feet , let up on the throttle and pushed the lever forward. Let off my foot. Engine starts racing. Uh oh. Line of cars behind us, dark out, radiator steaming, exhaust but rattling loose, and to top it off, exhaust was red hot. Pulled over to a side street and let it cool. Managed to make it home without incident. Turns out it was a clogged carb from. The zinc dissolving in the tank. I'll be sure to drain it from now on. Anyways, I fixed that plus the slipping clutch the other day, made an exhaust nut clamp and tightened the nut properly this time by shaking the exhaust and tightening. Drained the oil and flushed it out, went fishing for a cotter pin, and put it all back k together this morning. A friend came over and wanted to check it out and maybe go on a ride. Decided, why not? Started it up (mixture is still a bit rich, 1 3/4. Probably needs to be broken in still), throttle up, went in low down the driveway like last time, right again, low for about 50 feet, lever forward, throttle up, quickly took my foot off the clutch pedal. ZOOOOOM. The T was off. Nice, smooth shifting. No bucking or lurching or strange sounds. Nomore overheating, steam, rattling exhaust nut and leaks, or no high gear. I was so surprised that I missed the side street to turn around in. Kept going and turned in a dirt road. Brakes work suprisingly well. Better than I thought, as I keep reading they are awful. Suppose it helps having the wise brake drum. I'm used to the brakes on my Volvo 240, and it's got worse brakes than a T! Anyways. Features rebuilt coils by Ron, rebuilt NH from Russ, new rear axle thrust washers, new neoprene seals, rebuilt coil box, stock head, new wiring, new universal tires and tubes (yes, and flaps) aired to 27 psi, freshly lined large brake drums, and a bunch of other little stuff. Oh, and a rebuilt starter and generator, with an FP VR and rebuilt ignition switch. Here's how it looked off the trailer last year. Older photo from a couple weeks ago. all new tires now and mirror installed. License plates and the fuel line(shown by gas tank) also installed. Very Proud of You Young Man! Just came back from giving everyone a ride. Runs excellent. No more lurching or popping from a clogged carb. Noticed the gas cap gasket is too thin and let's some gas seep out sometimes. Love honking the Klaxon at passing cars. A couple will honk theirs, some wave, and about half do nothing. I did notice that the generator was barely charging. I'll have to see how it behaves. I checked the ammeter with lights on, read around 10 amp discharge (repro meter, not very accurate) with it not running. Running, it's still discharge but only about 5 amps. I am using 50 cp lights from Snyder's though. Rides like a dream. Slight tire wobbling. Will have to balance the tires. Also think a motometer is at the top of the want list. Radiator gurgles and some water flows out of the overflow until there's about a half inch of water over the tubes. Think this is normal? Still got a couple leaks to patch. The radiator will find its own level. 1/2 inch sounds like you are good to go. Looking very nice. Ask your wife or girlfriend to pad your seats for you, or Nathan Edwards down in Virginia. I think you want more than 27 psi in the tires. Looking good! Some tire wobble is fine (especially noticeable without fenders!). As for charging rate? I think it sounds fine. Generators can burn themselves out if they charge too much. I personally have always preferred a slight discharge with the headlamps on. If your battery is any good? You could drive all through the night at a five amp discharge. 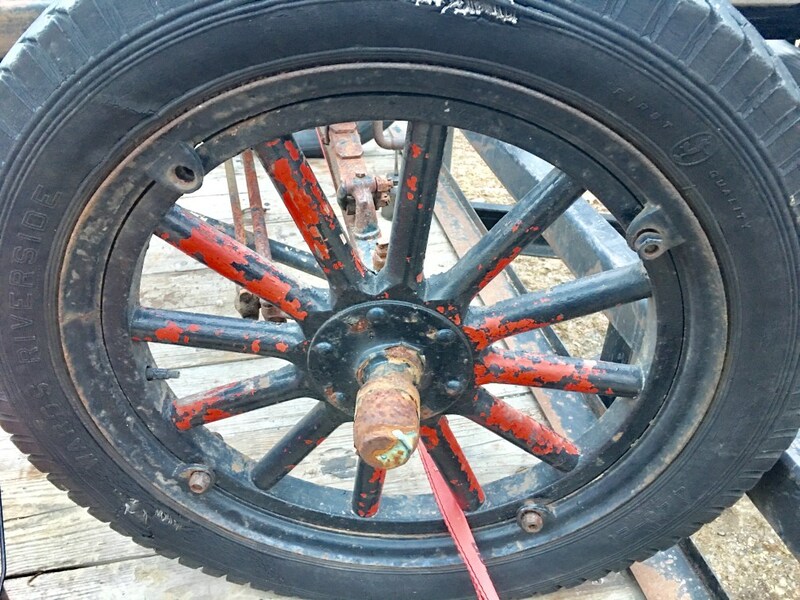 Dave, in 1926 Ford said to air them to 27 psi, plus there's been a heat wave in NH lately and don't want another blowout. Wayne, brand new good battery. You know we have something really rare here, a young man doing his research. I am humbled to see this as I still have my father and he always said, "Read the Book", "Then ask Questions". John, You are the next generation of what this hobby needs. Keep it up. Looks good and you will have a Summer full of fun ahead of you. Double kudos at being 16 years old. John, don�t count on those brakes too much, in a panic stop you could get yourself in trouble. I too have a 240 Volvo, my daily driver, about the best thing I like about it is the brakes. Terrific. Four wheel disc with power booster. Your speedster has so little weight over the rear wheels, they will slide very easily when you hit the brakes. Be careful. Looks good John! Quite a transformation from what you started with. Great job of troubleshooting as well. You are going to have a lot of fun with that build. Aaron, I've already experienced the sliding in our driveway. I now pump the brakes quicker (and firmly of course) and it seems to work better. No more skidding to a stop. Not bad so far. You may want to hang a spare wheel over the back for better weight distribution. If the current draw bothers you, try some cheap LED tail lights in the head lights, they're not that bad. Not that you would drive it that much at night, probably. Oh, and if the T has better brakes than a 240 volvo you might want to tinker with the 240s brakes.